Meet Gordon Brown (above) frequent guest at Chanters Lodge, Livingstone and also our guest on the most recent edition of the Chanters Lodge Experience with the Milli Jam Ingredient featuring Jay Hillz, The Experience is the weekly radio show sponsored by Chanters Lodge airing every Sunday night at 20.30 hrs for an hour live on Zambezi 94.1 fm, and is an easy mixture of latest international and Zambian pop music, interspersed with chat with our guest. 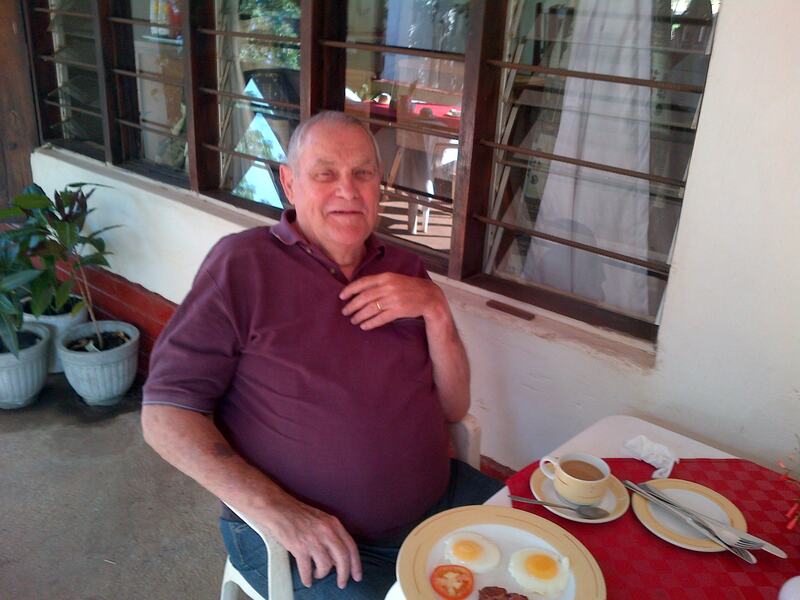 Gordon told listeners that this was his fourth or fifth visit to Livingstone in recent years, and that he found Chanters to be a good place to stay, not a luxury lodge, but homely, comfortable, clean with good food and helpful, friendly staff. That made us feel happy! Gordon is Canadian from Victoria, BC and spent 35 years as a primary school teacher, headmaster and administrator in the Canadian education system. He had been ‘retired’ for the past twenty years. He is a widower with a son, daughter and four grandchildren all living quite near him in Victoria. Our guest told listeners that he first came to Zambia in 1996 under VSO (Voluntary Service Overseas), a quasi British government outfit, as a lecturer at David Livingstone Teacher Training College in Livingstone. He had also spent time in Ghana under the auspices of VSO. The music on the show was good with tracks from Fuse ODG, Nero, Hayden James, Chris Brown, Beatenberg, Kayo, Majik Links ft K’Millian and Fifth Harmony. Gordon’s own taste in music he described as ‘very 50’s’! Sports wise he follows ice hockey and his grandson’s support of Wolves in UK has given Gordon a little interest in EPL soccer in UK. Gordon is very much involved in The Canadian Harambee Education Society (CHES) which helps girls get secondary education by raising funds for scholarships for Kenyan and Tanzanian girls who gain Secondary School placements, but have no funds for school fees. Also by placing CHES girls in boarding schools (wherever possible) to maximize their success. They also support special projects when donations are so targeted such as building dormitories, enriched learning centres and services to support them. CHES sends volunteers (often retired teachers) as agents in Kenya. Gordon is currently busy on a project to provide admin facilities for CHES in Kenya. Gordon had spent the day of the show in Chobe NP and had been delighted to see both lion and leopard, as well as the usual array of elephant and other animals on the trip. During his visit he would be going across to Zimbabwe to see the Falls from that side, plus a visit to Nakatindi Community School to review progress, as he had been involved in the establishment of that school. Asked where he would like to be and what he would like to be doing ten years’ from now he replied that he would like to be alive and productive.